Light + Love : Gratitude List. 1) Got a slot in the HH Wedding Photography Workshop (happening in September at the Manila Pen). I'm quite excited because I really like the style and work of OC. 3) Inspiring stories of people who live authentically beautiful lives. 4) Knowing the truth. Seeing clearly. 5) Spending time with family. 6) Touching messages from friends, acquaintances, and strangers about my photography. 7) Phone calls, skype chats, quick notes, lovely postcards, pretty camera necklaces, and all the simple little things. 8) Kindness of strangers. Surprises from friends. 10) Soothing sound of rain at night. 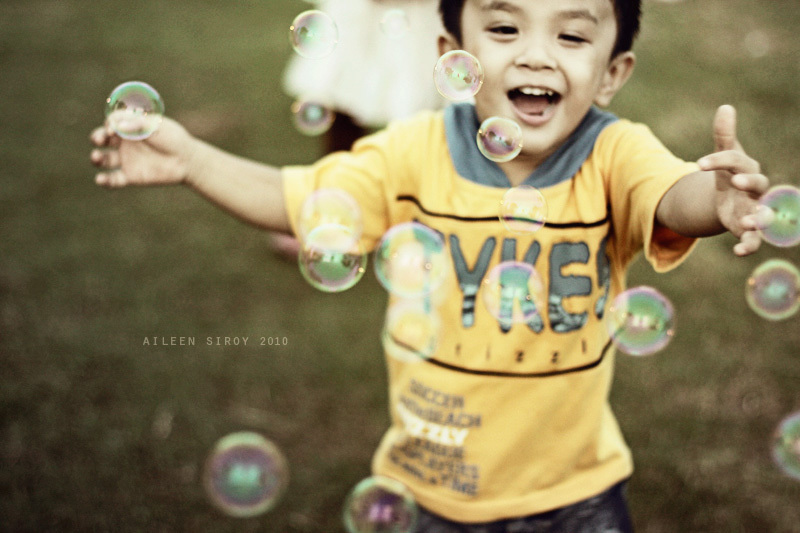 Photo: My sipat two-year-old nephew, Anyo. Bubbles! weee! I've tried several times taking photos like this. Naubos na ang bubbles, hindi maka-chamba ng magandang kuha. Haha! This is such a happy photo! It made me smile. Amazing imong powers maka-apas kag pinaspasay na lihok, siroymylab. You're not just lightchaser; you're kidchaser, too! Hahaha! I can actually imagine you doing shoots! With your nieces, right? They are lucky to have you! And yes, mahirap to get bubble shots. This is the only decent one I have. LOL.